Hi, I’m Harris Harrington. Welcome to my website dedicated to sufferers of chronic depersonalization disorder. Do you want tons of free advice and info on depersonalization and derealization? Check out my many free full length articles and free videos. I have a special free article series called the Depersonalization Cure Tip Series. Do you have a question about depersonalization? Have a look at my thorough FAQ. Interested in making a full recovery from depersonalization and derealization and getting back to your old life again? 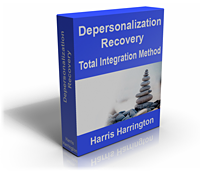 Then check out my 10-hour video program Depersonalization Recovery: Total Integration Method.